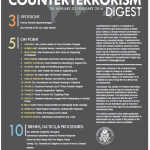 Counterterrorism Digest is a compilation of UNCLASSIFIED open source publicly available press material, to include relevant commentary on issues related to terrorism and counterterrorism over the past seven days. It is produced every Wednesday, excluding holidays. 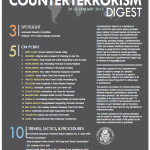 Counterterrorism Digest is produced by the National Counterterrorism Center and contains situational awareness items detailing on-going terrorism-related developments which may be of interest to security personnel. 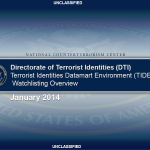 A National Counterterrorism Center presentation from January 2014 on watchlisting individuals in the Terrorist Identities Datamart Environment (TIDE). 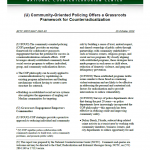 The community-oriented policing (COP) paradigm provides an existing framework for collaborative grassroots engagement that has the potential for success in counterradicalization outreach efforts. COP leverages already established community-based social service programs to address individual, group, and community radicalization factors. 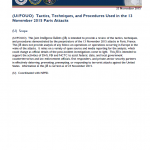 This Joint Intelligence Bulletin (JIB) is intended to provide a review of the tactics, techniques, and procedures demonstrated by the perpetrators of the 13 November 2015 attacks in Paris, France. This JIB does not provide analysis of any follow-on operations or operations occurring in Europe in the wake of the attacks. 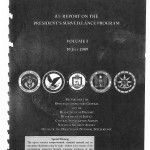 It relies on a variety of open source and media reporting for the analysis, which could change as official details of the post-incident investigations come to light. 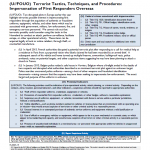 This JIB is intended to support the activities of DHS, FBI and NCTC to assist federal, state, and local government counterterrorism and law enforcement officials, first responders, and private-sector security partners in effectively deterring, preventing, preempting, or responding to terrorist attacks against the United States. 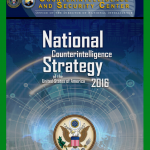 The National Counterintelligence Strategy of the United States of America 2016 (Strategy) was developed in accordance with the Counterintelligence Enhancement Act of 2002 (Pub.L. No. 107-306, 116 Stat. 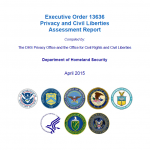 2383 (as amended) codified at 50 U.S.C. sec. 3383(d)(2)). 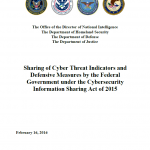 The Strategy sets forth how the United States (U.S.) Government will identify, detect, exploit, disrupt, and neutralize foreign intelligence entity (FIE) threats. 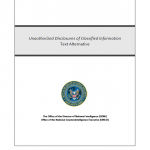 It provides guidance for the counterintelligence (CI) programs and activities of the U.S. Government intended to mitigate such threats. 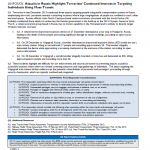 This Joint Intelligence Bulletin highlights the potential risks for US persons traveling to Syria or Iraq to combat the Islamic State of Iraq and the Levant (ISIL) or expressing online a desire to do so. 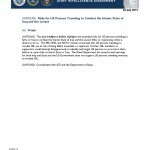 The FBI, DHS, and NCTC remain concerned that US persons traveling to combat ISIL are at risk of being killed, wounded, or captured. Further, ISIL members or supporters could attempt disingenuously to identify and target US persons so as to harm them before or upon their arrival in Syria or Iraq. The State Department has issued travel warnings for both Iraq and Syria and the US Government does not support US persons traveling overseas to combat ISIL. 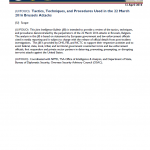 In the first half of 2015 there were at least two instances of Islamic State of Iraq and the Levant (ISIL) inspired individuals in the West expressing interest in targeting law enforcement (LE) to obtain weapons and other specialized gear through theft. 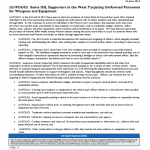 As ISIL continues to exhort its individuals in the West to carry out attacks, the potential exists that some terrorists may use this tactic and attempt to steal weapons or issued items, such as credentials, badges, uniforms, radios, ballistic vests, vehicles, and other equipment, which could be used in furtherance of an attack. We note that laws governing the purchase of firearms differ widely among Western nations making this tactic more likely to occur in countries where laws are most restrictive and firearms are harder to obtain through legitimate means. This course identifies and discusses employees’ responsibilities for safeguarding classified information against unauthorized disclosures. This course also outlines the criminal and administrative sanctions which can be imposed for an unauthorized disclosure. While there are multiple categories of unauthorized disclosures, this course will focus on unauthorized disclosures to the media due to the significance of the damage these leaks have caused to both the Intelligence Community (IC) and national security. 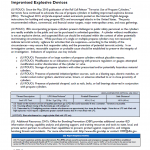 Efforts to gain expertise with explosive, incendiary, and chemical/biological devices may lead to injuries and emergency treatment, which may provide potential indicators of violent extremist activities to responding emergency medical service (EMS) personnel. Scene size-up and patient assessment provide first responders the opportunity to view both the scene and any patient injuries. 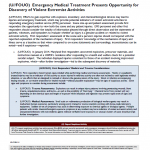 EMS personnel and other first responders should consider the totality of information gleaned through direct observation and the statements of patients, witnesses, and bystanders to evaluate whether an injury is a genuine accident or related to violent extremist activity. College programs in unmanned aircraft systems (UAS) are susceptible to potential penetration or attack plotting by violent extremists. Enhanced information and operational security practices can reduce the likelihood of a violent extremist infiltrating UAS programs or planning an attack against students and faculty. There are potential indicators that a student or faculty member may possess ulterior motives for their interest in unmanned aircraft. 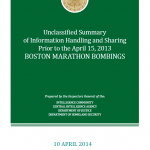 Terrorists in late December 2013 conducted three attacks targeting people using public transportation systems in Russia, emphasizing terrorists’ persistent interest in attacking locations where large congregations of people are confined to small, often enclosed spaces. Russian officials claim North Caucasus-based violent extremists associated with the Imirat Kavkaz (IK) probably conducted these attacks to embarrass the Russian government in the build-up to the 2014 Olympic Games in Sochi. The IK, a violent extremist group based in Russia, has no known capability in the Homeland and is unlikely to directly target Western interests overseas. 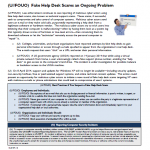 Law enforcement continues to see reporting of malicious cyber actors using fake help desk scams, also known as technical support scams. 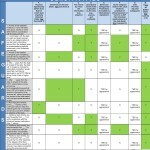 These scams, if successful, seek to compromise and take control of computer systems. Malicious cyber actors send users an e-mail or they make cold calls, purportedly representing a help desk from a legitimate software or hardware vendor. 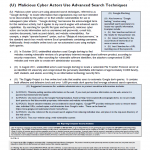 The malicious cyber actors try to trick users into believing that their computer is malfunctioning—often by having them look at a system log that typically shows scores of harmless or low-level errors—then convincing them to download software or let the “technician” remotely access the personal computer to “repair” it. Facility security measures, such as interior control points or exterior barriers, may require first responders to adjust normal protocols and procedures to operate rapidly during emergencies. 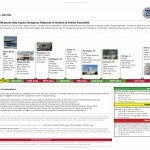 The timeline below is an overview of attacks and plots against US-based facilities with varying levels of security. The diversity of tactics and targets used underscores the need for interagency exercises and training that incorporates multiple scenarios to account for building security measures likely to be encountered. 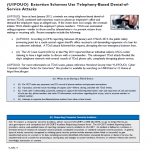 Since at least January 2012, criminals are using telephony-based denial-of-service (TDoS) combined with extortion scams to phone an employee’s office and demand the employee repay an alleged loan. If the victim does not comply, the criminals initiate TDoS attacks against the employer’s phone numbers. TDoS uses automated calling programs—similar to those used by telemarketers—to prevent victims from making or receiving calls. Understanding master narratives can be the difference between analytic anticipation and unwanted surprise, as well as the difference between communications successes and messaging gaffes. Master narratives are the historically grounded stories that reflect a community’s identity and experiences, or explain its hopes, aspirations, and concerns. These narratives help groups understand who they are and where they come from, and how to make sense of unfolding developments around them. As they do in all countries, effective communicators in Afghanistan invoke master narratives in order to move audiences in a preferred direction. Afghan influencers rely on their native familiarity with these master narratives to use them effectively. This task is considerably more challenging for US communicators and analysts because they must place themselves in the mindset of foreign audiences who believe stories that — from an American vantage point — may appear surprising, conspiratorial, or even outlandish.